The generations that were raised on 2D feature animation have long since dissipated into the age of CGI, leaving behind a medium still so pervaded with promising ideas that it's discouraging to see most of them go almost completely ignored at the box office. Consider Disney's last traditional feature cartoon "Treasure Planet," a dazzling adventure with visual spectacles outside of the studio's norm—produced on a budget estimated to be between 140 and 150 million, the film took in a measly 30 million dollars during its initial theatrical run last fall, making it one of the genre's biggest commercial disasters of the recent past. Meanwhile, the current animated champ, the PIXAR-produced computer cartoon "Finding Nemo," looks about ready to upset "The Lion King" as the most successful of all time in feature animation, a feat that seemed impossible even to the CGI giants like "Shrek" and "Toy Story." Somewhere behind the seemingly endless hoopla surrounding computer-generated deep sea fish, Dreamworks is releasing "Sinbad: Legend of the Seven Seas," a 2D cartoon crammed with swashbucklers, thieves, treasure seekers and mythological creatures like it were spun off from a kiddie version of the "Xena: Warrior Princess" series. The mere effort to unleash any kind of standard cartoon feature against such a strong competitor is a gutsy move, even on the part of a man like Jeffrey Katzenberg (who spent years under the Disney name), but if there was ever to be serious competition between either product in the first place, it would require more than just relentless promotion on the studio's part. 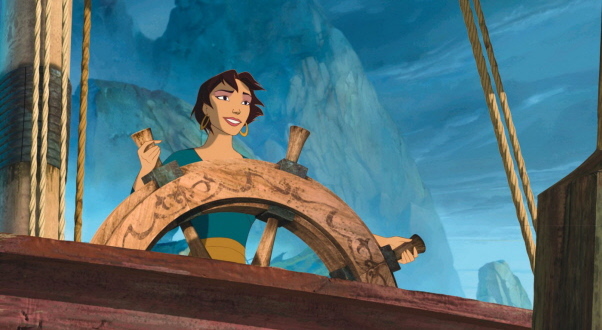 What allowed a movie like "Treasure Planet" to exemplify the untapped possibilities of 2D features was not just its color or nifty visual gagets, but its strong sense of presence as a vehicle for exciting storytelling. "Sinbad" contains lots of scenes that leave the eyes popping out of their sockets, but it lacks the necessary thrust to keep viewers of any specific age engaged or interested. The movie is not very exciting or interesting, and seems to plod through one situation after the next like its filmmakers were working with pieces of an unfinished script. This is not the kind of movie that keeps our hopes alive for a successful return of the standard animated feature. The film starts out innocently enough, as two cruise vessels plow their way through the rough terrain of the ocean en route to a specific destination. One, an official navy vessel carrying a special artifact to a distant shore kingdom, is headed by a man named Proteus (Joseph Fiennes); the other, a seemingly run-down ship that tags distantly along in hopes of surprising the other in an ambush, is captained by Sinbad (Brad Pitt), a successful sea thief who, by some strange twist of fate, knew Proteus years before. In one lifetime, both men were friends, but now Sinbad has come to rob his former buddy's ship of its most precious cargo: the Book of Peace, which when opened keeps all the Seven Sea kingdoms in peaceful alliance with each other. Proteus, needless to say, isn't about to part with the treasure, even if it means having to fight Sinbad in order to protect it. Eventually, the book makes it to its intended destination, but not because the outlaw swashbuckler didn't at least try. In the background of Sinbad's goal is the movie's villain, the so-called Goddess of Chaos, Eris (Michelle Pfeiffer). After he nearly dies during his ill-fated attempt to acquire his treasure, she saves his life and strikes up a unique deal with him—if he agrees to steal the book and then give it to her, she will reward him in ways that no one ever could. Being a pirate of sorts, of course, how does a man ignore that prospect? Then again, how can you do something like that when it means threatening the security of a former best friend in his kingdom? Somewhat quickly, Sinbad decided not to steal the artifact, but that does little to phase Eris' chaotic tendencies; she steals the book herself and makes it look as if the thief really did do it himself. The kingdom threatens to end his life as a result, but not before Proteus steps in to take his place on the executioner's block. And unless Sinbad, along with the help of Proteus' fiancee Marina (Catherine Zeta-Jones), can travel to Eris' lair to retrieve the book from the witch's grasp, Proteus won't have any future to look forward to. The character of Sinbad, as far as I know, is one that has shown up in countless stories about sea quests and voyages; he is sort of a pirate without actually displaying the fundamental pirate traits. That could be fine in any story that knew what it wanted to do with its hero, but "Sinbad: Legend of the Seven Seas" doesn't clearly distinguish what path it wants the guy to go in. The character is established on a very ambiguous middle ground, so much so that we don't really know what to feel for him through most of the movie, if anything at all. Will he complete his assignment and rescue the prince from impending death, or will he cower out of it and escape to an exotic island paradise to lead a carefree life? The questions are irrelevant because the movie doesn't care about them. Occasionally, we see Marina, the Zeta-Jones character, call him on his macho behavior, hoping that her influence will soften his ruggedness, but no real progress seems to get made. In fact, by the time the movie pulls out its climax and Sinbad's makes his final moral decision, it feels abrupt and unexpected, even though it shouldn't be. If the lead role demonstrates obvious weaknesses in writing, so does the villain's. This Eris goddess, who thrives on taunting her victims without actually severing the puppet strings completely, doesn't have any kind of presence whatsoever. She is what we refer to as the "fill-in villain," a being who acts as if he/she is standing in for a much more menacing antagonist who never even bothered to show up. Her purpose of taunting others and playing with their fates is not exactly a weak reason to accept her as the villain, but the characterization is played with such transparency that she never seems to have significance. As far as the look of the film, "Sinbad: Legend of the Seven" seas continues Dreamworks' string of brilliant-looking animated features, combining familiar hand-drawn elements and digitally-rendered backdrops without appearing like two different kinds of movies at once. There is a beautiful sequence at the midway point when Sinbad and his crew are nearly destroyed by a group of enticing (but deadly) sirens, and another when the crew think they are picking fruit off the surface of an island, only to discover that they are riding the back of a gargantuan sea creature. Visuals as grand as these, alas, only add stress to the previous point made, which is that "Sinbad" isn't very good in terms of being adventurous, original, exciting or engrossing. There is no doubt that animated films look better than they ever have, but is it really that hard to find a decent screenplay to utilize at the same time?